I don't cook pork very often. Personally, I'm not a huge fan. I do add it to our menu every now and again just for a change from our usual beef or chicken dinners. Especially, when it's on sale cheaper than chicken at times. Talking to a friend a few weeks ago, I wanted to try a recipe for Maple Glazed Pork Chops. For some reason, I assumed that the recipe was for the slow cooker. Instead, it was a grill recipe. Not the cooking method I was prepared for today. While the kiddos played nicely together, I decided to search Pinterest for Crock Pot Pork Chop Recipes and came up with quite a few options. This recipe for Peking Pork Chops seemed to be the easiest for the time frame I had to throw it together and get it cooking. Place chops in bottom of crock. Pour over meat, flipping chops to cover both sides. Cover, set on low for 4 hours. To toast the sesame seeds, I just sprinkled them into a nonstick pan over medium-high heat and shook the pan to toss the seeds a bit until they turned golden brown. Oh, goodness! This dinner was so delicious! The pork was so moist and tender, not dried out which is usually how pork chops turn out when I cook them! The meat fell right off the bone as I served up our dishes! I do think this will be our go-to pork recipe. This sounds great! The combination of brown sugar, ginger and soy is amazing! Oh wow, this sounds delicious! I'm like you, pork isn't my favourite but I add it once in a while just to mix things up a bit, but I always find it to be dry and tasteless. I will definitely be trying this very soon and to make sure I don't lose it I've pinned it to my yummy recipes board. Thanks! These look fantastic! Many times crock pot recipes seem kind of watery, but this sauce/glaze looks thick and...oh my. I have bookmarked this and will be making it REALLY soon! This is so different from most of the crock pot recipes I have seen, and it looks amazing! Oh YUM - that dish looks mouth watering. I too, love to fix pork in the crock pot, so it's nice and tender. I truly love the combo of flavors in this recipe. Thanks so much for linking up at Weekend Potluck....please come back soon. This is a fabulous recipe, your recipes are always good! I love that it is in the Crock Pot. Hope you are having a great weekend and thank you so much for sharing with Full Plate Thursday. This recipe sounds delicious! Any idea how long for boneless pork chops? It's all have on hand today! I tried this recipe today with boneless chicken breasts and it was delicious! I sliced them in half so that they were thinner and then shredded them towards the end. I also used some cornstarch to thicken up the sauce. This recipe is definitely a keeper! I made it with pork and all three kids AND hubby chowed down! It worked perfectly with SIX chops, there was still plenty of glaze, although I wouldn't push it further than that. 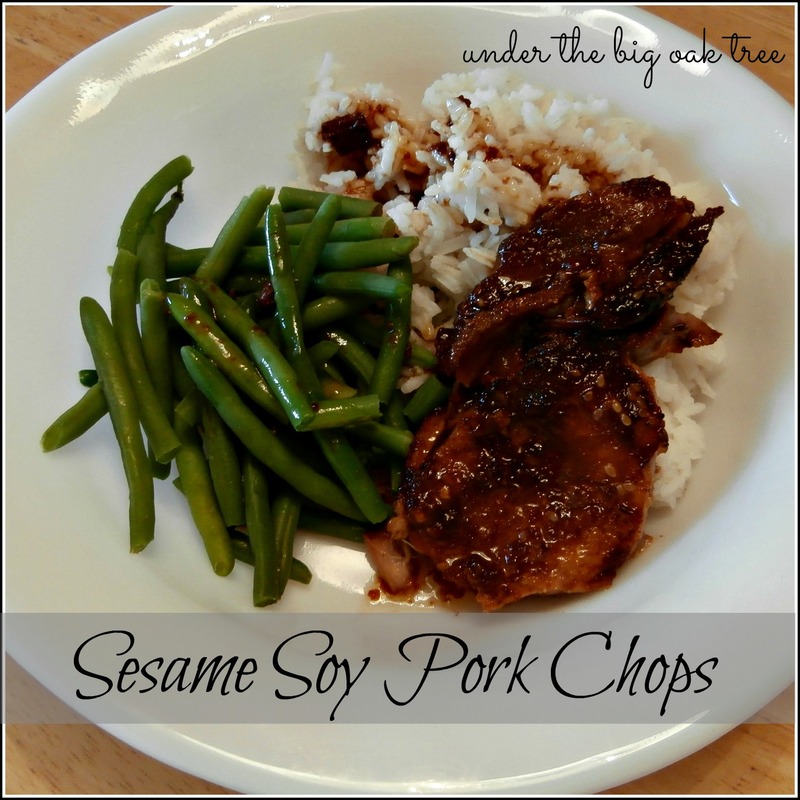 I served it with brown rice and put the glaze over the rice and chop together - delicious! I think I'm going to follow Jenny K's lead and thicken up the glaze with some cornstarch and make it really GLAZE-Y! Totally delicious and definitely a keeper.